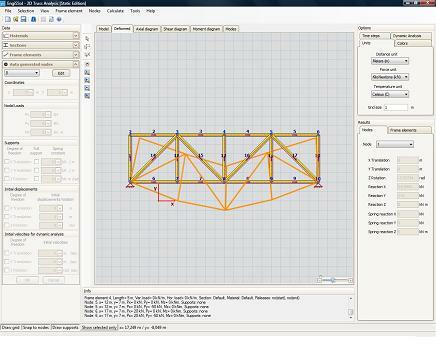 Perform static analysis of simple or complicated trusses and quickly get nodal displacements, reactions, axial forces. Automatically create professional calculation reports. Truss analysis is now as easy as ever! 2D Truss Analysis Static Edition can handle any 2d truss effeciently and calculate its internal forces, support reactions, deformed shape etc. It has the ability to automatically create calculation reports that can be exported to .doc, .pdf and .xls file formats. It uses the powerful solution engine of 2D Frame Analysis Dynamic Edition, therefore its robustness and reliability are undoubtedly its main features. The user interface is user friendly, very easy to use with interactive capabilities. It is offered at a really low price, you can take advantage of the opportunity to try it!